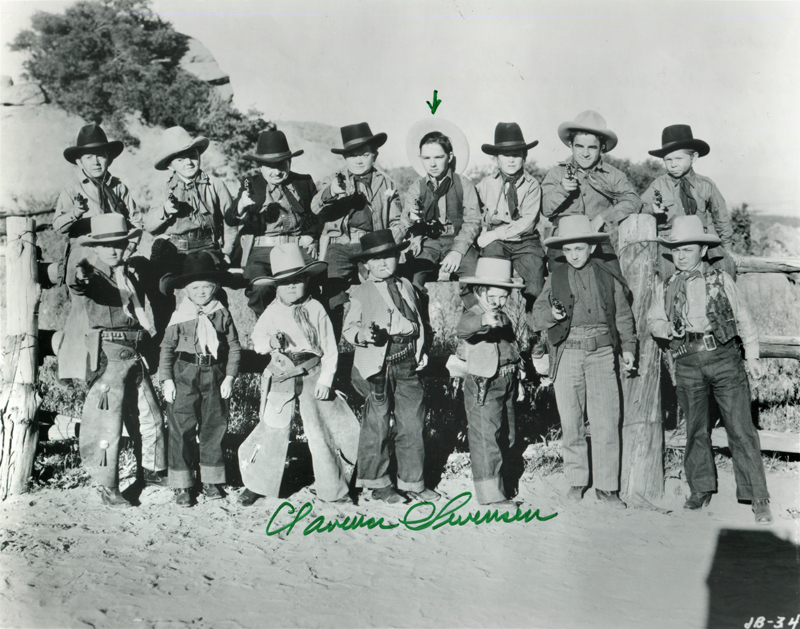 SCVHistory.com LW2723 | Melody Ranch | 'The Terror of Tiny Town' (1938), Publicity Still, Autographed. Jed Buell's Midgets (a vaudeville troupe) star in the dramatic Western musical, "The Terror of Tiny Town" (Columbia Pictures 1938). Principal shooting was done in Placerita Canyon at Ernie Hickson's Placeritos (Monogram) Ranch, later called Melody Ranch, although this publicity still appears to have been shot somewhere else. 8x10 glossy later-generation copy print autographed by August Clarence Swenson (1917–2009), who portrayed a preacher (uncredited). Other than later-in-life retrospectives, his only other known screen role came in 1939 when he played a Munchkin soldier (also uncredited) in "The Wizard of Oz," which paid him $700. LW2723: 19200 dpi jpeg from copy print purchased in 2014 by Leon Worden from a collector in Nova Scotia, Canada.